Do you believe in the magic of Fairies? You can build an oasis of green plants, flowers and grass all alongside a beautiful path in the woods, just for your fairies and gnomes to call their own. 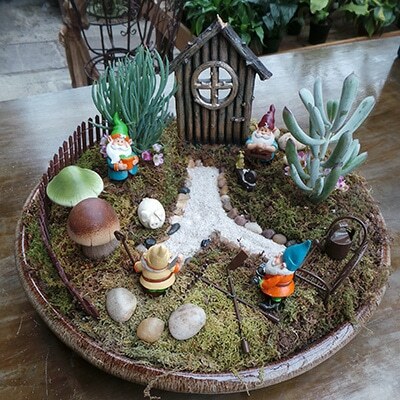 If you find these new Fairy Gardens as adorable as we do, you’ll be excited to know that we have many different pieces including live accent plants to create a unique Fairy Garden of your own! Dream up your own garden and use any or all of these fairy garden accessories, which you can find right in our greenhouse! You’ll need to start with a container for planting. Pick any style of container pot, making sure it is large enough to display all of your fairy garden accessories. 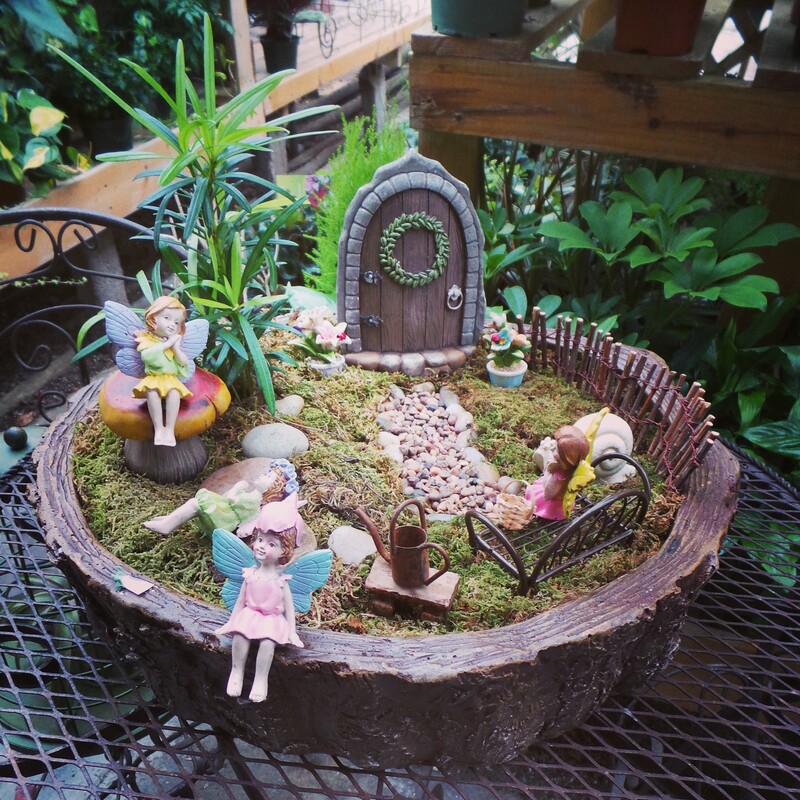 We have fun and unique containers just for an enchanted fairy gardens, but your garden can be in any pot or container you choose, use your imagination for a truly whimsical home. Add soil to your pot for planting, but be fore you do, make a plan for your garden layout. You might even want to draw out your garden with the accessories you have to get a good idea on how to layout the items within your space. We even drawn paths, benches, doorways and trees right in the soil to help us plant moss, put down rock and place other accessories like trees and flowers. We suggest starting with your soil about an inch below the top of the container or pot. Next plant the moss and live plants in their appropriate place according to your drawing or fairy garden plan. After planting, you’ll want to put your paths into place. You can lay the rocks, sand and pebbles in place on top of your soil. Don’t forget to line your path with stones! After your grass (moss) and stones are in place, start arranging furniture into the garden bed. We have furniture pieces including iron benches and stumps for sitting. You can get creative with your furniture and decor too; try using natural pieces such as wood, bark and branches for the perfect sitting nook. Now it’s time to place your fairies and gnomes into their new home. Seat your fairies on stumps, benches and grassy knolls. Maybe your gnomes are gardeners; give them miniature garden tools to care for their enchanted oasis. Remember that Fairy Gardens are a magical space filled with nature, beauty and joy. We know your Fairy Garden will be a place for enchanted memories too! Try this fun potting activity with your children or grandchildren, they will love being able to use their imagination to create something you both will admire all season long! Looking for ideas on how to make your perfect miniature fairy garden? Stop by our greenhouse to see a few magical gardens we have created too!